Last night also happened to be the live webshow of House of 3 too so I had my fingers in a lot of pies. After watching the webshow I decided to chat with the ladies over at Kenner Road. If you are intimidated by chats I can tell you that the monthly chat at Kenner Road (on the 14th of the month at 8 p.m. Pacific) is the place to introduce yourself to chat rooms. The people are as sweet as a hot chocolate on a cold winter night. Everyone is happy, helpful and friendly. Plus kl, the woman behind Kenner Road, is just one of those people who creates joy whether it is in her own art, with her kits or in how she treats her customers. After I chatted, did a little (too little for my liking, but there is such a concept as a budget--ugly, nasty word!) 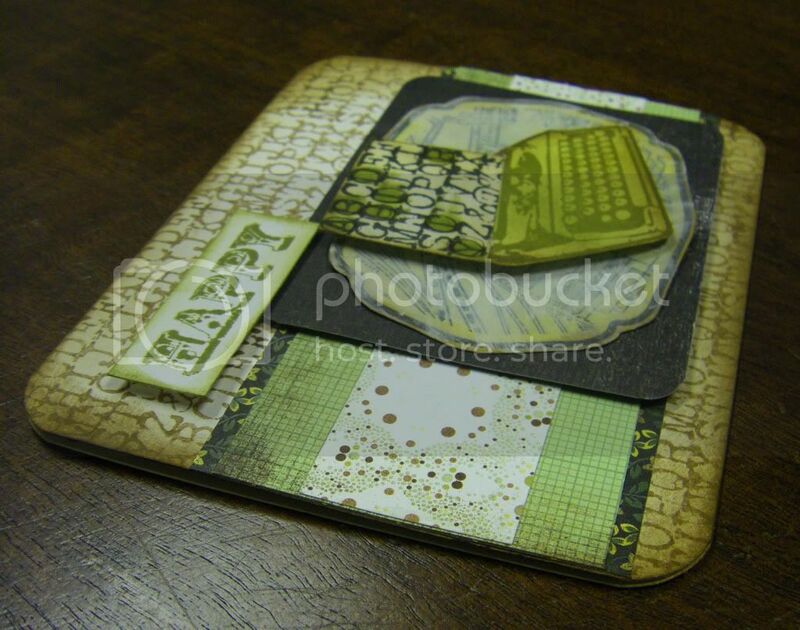 shopping and pined for a whole lot more, I made another card. It came out a bit dark and full of grunge because it is yet another masculine card. 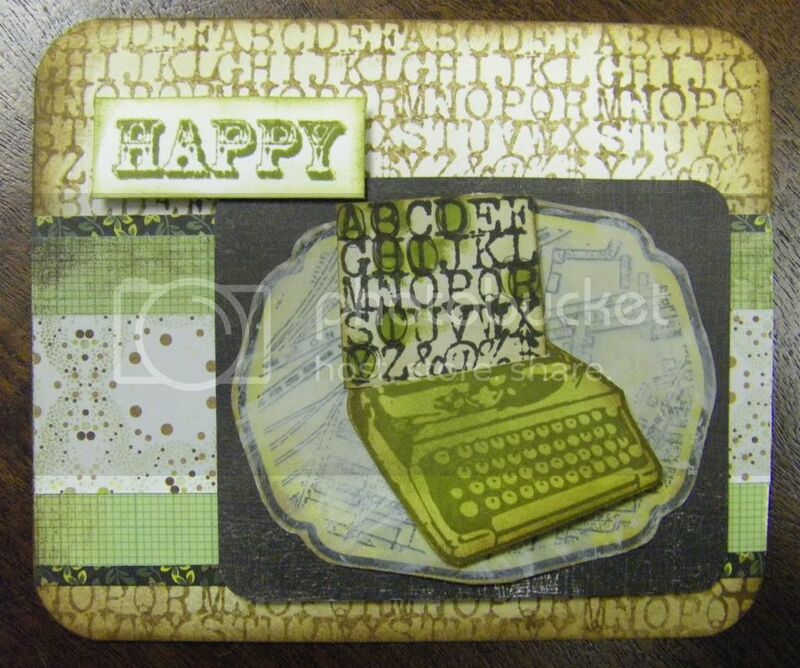 I am coming to believe I make more masculine cards than feminine which is odd when I come to think of it...no wonder I am trying to build up my Tim Holtz stamps and products and other stamps and products that work for guys/boys. Thankfully, Papertrey Ink just addressed males in this month's release although unfortunately I can't buy any of it yet (budget rears its ugly, nasty head again). 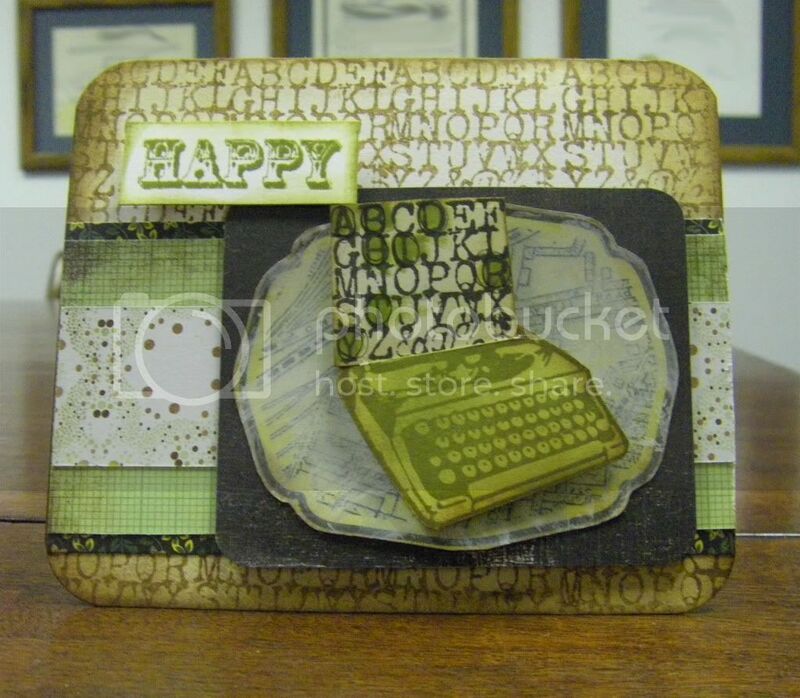 Anyway, there was a typewriter with a typewriter font alphabet block stamp set from Studio Calico I wished to use and I decided to keep with the whole Basic Grey Origins kick I have had all year (Heck, why break with the trend when I had made cards for this cousin's brothers and father with the Origins line already. Surely he would wonder if his card didn't match--well, if he noticed such a thing). I may have gone a little overboard with the distressing and the card is a bit busy, oh and the concept I had has to be explained for anyone to get it (Hint: notice which letters I highlighted on the "typwritten page" coming out of the typewriter as it actually spells out something even if the letters aren't in order for the word), but it's the thought that counts, right?